Bill was elected as a Member of Parliament at the 2006 Victorian State election, with reelection in 2010 and 2014. As the son of a Defence Force member Bill was fortunate to be able to live in different locations of Australia while growing up, learning the traditions of Defence and being accustomed to socialising with diverse and varying groups. Joining the Defence Force himself as a young and eager 17 year old his first experience of the Benambra electorate was a posting with the Royal Australian Army Military Police in 1983 to Bandiana. During this time, Bill found himself at home in the region and resolved that wherever his work took him he would return. 1995 saw a career change with the decision made to join the Victorian Police Force. The roles Bill held with the Victorian Police enabled him to challenge his skills and focus on his strongly held belief that the provision of safe communities creates a healthier lifestyle for all. Bill’s work with the Army and Victoria Police taught him the importance of hard work and reward for effort stablised with an appreciation for diversity. With the desire to develop communities for the future, entering politics was the logical next phase in Bill’s career. It provides him with the opportunity to listen and act on behalf of the local community in a legislative capacity and develop infrastructure to steer economic growth and employment. Bill fought for the sealing of the Omeo Highway, advocated for Wodonga Senior Secondary College to be redeveloped, the building of the new Belvoir Specialist School, building of the Eskdale DEPI depot and for funding for Benambra’s recreational facilities. During his last term in government Bill secured over $135 million in built and social infrastructure, above and beyond government operating costs. Bill advocated for the funding and development of an improved Wodonga Emergency Department to modernise and improve efficiencies in service delivery. Bill has always been involved in sport and recreational pursuits. From playing golf to fishing the local waterways, Bill sees sport, for all ages, as a healthy lifestyle choice for fitness and social reasons alike. With years of consultation and advocating for local small businesses Bill understands the obstacles they face just in keeping the doors open. Supporting small business and assisting them with pathways for growth and economic stability will always be a priority for Bill. Whether you are a child, student, farmer, blue collar worker or corporate professional, Bill’s plan for Benambra is to ensure a strong economy with progressive infrastructure development. By achieving this, the jobs and skills we need for the future are safeguarded and we have a stronger and safer community. Benambra District is a rural electorate situated in the north east of Victoria. Benambra District presents 10,037 square kilometres of some of the most picturesque country in Victoria. Offering spectacular waterways such as Lake Hume, Dartmouth Dam and the Mitta Mitta and Kiewa Rivers, through to the scenic mountains of the Victorian Alps. Tourists and locals alike can indulge in the many activities available. 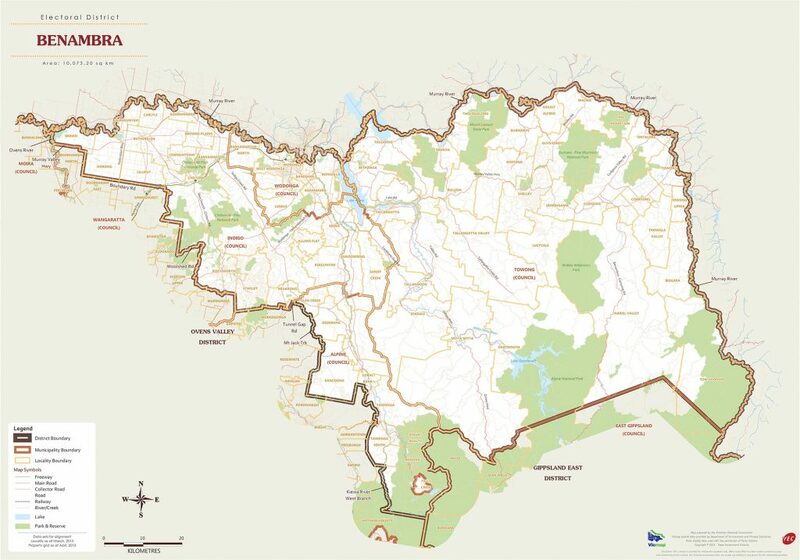 The townships of Baranduda, Barnawartha, Beechworth, Chiltern, Corryong, Eskdale, Kiewa, Mitta Mitta, Mount Beauty, Rutherglen, Tallangatta, Tangambalanga, Tawonga, Wahgunyah, Walwa, Wodonga and Yackandandah form the major centres within Benambra. The main industries for the district include agriculture, wine production and tourism.